Last Saturday we finally got the new kendo season in Almere off to a start! A week late, but we enjoyed it nonetheless. Turn-up was good, with roughly fifteen students and two teachers present. Because the training hall is completely new to us it took us a while to get started. New dressing rooms, a different floor, dust and crap left-over from construction that we needed to clear from the floor, etc. All in all we got started half an hour late, after most students had busied themselves with cleaning, kata or warming up. I chose to do stretches and footwork practice and around 0930 felt like I was pushing myself. Already! Even half an hour in I was hot and tired, how odd! I'm glad that Martijn and I continued practice over summer, because I don't know what state I'd've been in otherwise. I guess it might've been the heat in the training hall, because after said half hour I felt great. Even the extended footwork practice during warm-up didn't phase me, while it usually wears me out. I even had breath enough for good kiai! In the end sensei indicated that he wasn't very happy with the state of everybody's kendo. It showed that we'd had a holiday and many people were being sloppy and rushed. One specific thing that Hillen pointed out to me is that my fumikomi is off: my shinai is always trailing behind my footwork. That's something I need to work on! Because of the dark and because I can't wear my glasses inside the men we didn't get to do too much practice. Martijn did show me an excellent exercise: while motodachi repeatedly strikes men, shidachi will parry each blow and immediately make a do strike. So basically the student practices kaeshi do. It's a fun and useful exercise. Yesterday marked the beginning of the 2011-12 kendo season at Renshinjuku Almere (錬心塾剣道 アルメレ). Everybody was rearing to go, excited to try out our new training room at the new Nautilus College building. But sadly it wasn't to be. Sensei had all the keys and everything had been arranged, but sadly he had been given the wrong PIN for the alarm system. So we had to cancel our first day of the new season. On a nice note: from now on I am allowed to train in bogu! I recently had an email discussion with sensei Ton, about the fact that Martijn and I had been doing some jigeiko, but that we would put it off for now at the fear of bodily harm. Sensei then replied that I could borrow one of the dojo's loaner bogu to get me started, before ordering my own set. So yesterday, in the parking lot, we picked out a set of armor, which I then tried on at home. 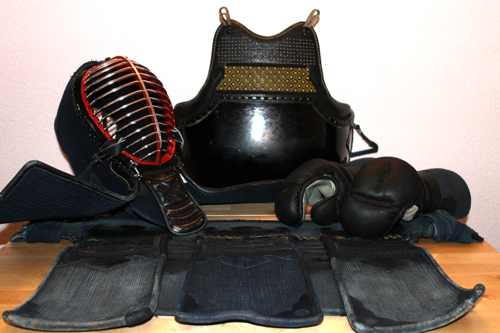 The tare (waist armor) and do (belly and chest) are fine, though the himo (ties) of the tare are -very- worn out. The kote look quite akin to boxing gloves, but are comfortable. Sadly, the men (helmet) is not a perfect match: it's too tall (which can be fixed with padding) and also so narrow that I cannot fit my glasses at all. Martijn's men allowed me to keep my glasses on, so I guess it's a matter of finding the right helmet. I will put on the armor a few times this week, to grow more accustomed to it all.